A mixture of large and small wildfires occurred across Colorado in 2018. These fires were due to a mixture of dry conditions, combined with gusty, warm winds and, sometimes, careless fire prevention efforts. There were instances when residents had to be evacuated as a large wildfire moved toward larger communities. Would you know what to do to protect yourself and your loved ones in this situation? In addition, if you live in an area that is susceptible to wildfires, how can you prepare yourself and your home? To assist in your preparation for fire…the National Weather Service provides a variety of fire weather forecast products. Twice a day in Colorado…fire weather planning forecasts are made from each weather service office serving the state. 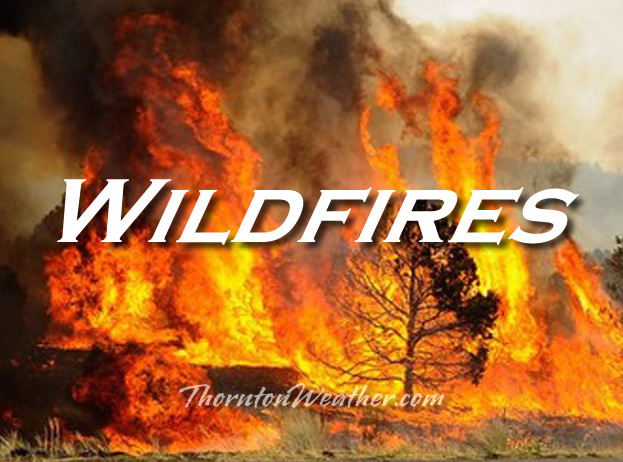 A Fire Weather Watch may be issued if in the next 12 to 48 hours the forecast includes gusty winds of 25 mph or greater…relative humidities of less than 15 percent for at least three hours, dry lightning, or a combination of weather and fuel conditions that may make large wildfires possible. The fire weather spot program supports land management agencies for both prescribed burns and for wildfires. A fire weather spot forecast is a detailed forecast for an individual fire. For national type 2 or type 1 fires the National Weather Service will detail an IMET…incident meteorologist to a fire team to provide onsite weather support and detailed fire forecasts. If you live in the urban interface there are a number of actions you can take to reduce your personal fire threat including reducing vegetation near the home and putting a fire resistant roof on your home. More information is available from your National Weather Service at: http://www.nws.noaa.gov/om/fire or from your Department of Homeland Security at: http://www.ready.gov/wildfires. When a fire occurs, there may be years of increased flood threat on the burn scar, as a healthy forest can handle an inch to inch and a half of rain with no flood risk. Once the litter and vegetation is removed by fire…as little as a half inch of rain in a short period can cause serious and possibly life threatening flooding. This entry was posted on Thursday, March 7th, 2019 at 4:07am MDT and is filed under Weather Education. You can follow any responses to this entry through the RSS 2.0 feed. You can skip to the end and leave a response. Pinging is currently not allowed.